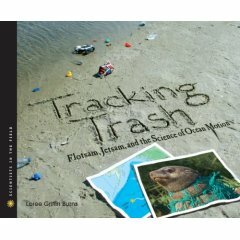 Earlier this week, Kelli wrote a post called “Teaching Kids About Trash“, in which she asked her high school sustainability class, “When you throw something away, where does it go?” “Away” is the topic of Tracking Trash: Flotsam, Jetsam, and the Science of Motion by Loree Griffin Burns. Based on the research program of oceanographer Dr. Curtis Ebbesmeyer, Tracking Trash chronicles the journey of trash in our oceans (Be sure to read to the end of this post in order to learn how to win your own copy of Tracking Trash). Tracking toys and sneakers gives us a chance to see what the ocean does with our trash. We can see the movement of trash by the great ocean currents and we can see the disintegration of the trash over time…and we can learn from it. So where did all those sneakers come from? During a Pacific storm, the Hansa Carrier, a cargo carrier from Korea, lost 21 metal containers. Five of those containers contained Nike tennis shoes. Burns tells his story, along with those of other scientists and citizens who track trash, and shares their genuinely fascinating and important discoveries about oceanic currents. It’s a science text, but there’s a bit of detective novel thrown in as well. To win a copy of Tracking Trash, ask your children the very question Kelli asked her class: “When you throw something away, where does it go?” Leave a comment to this post with your children’s answers. The winner will be selected randomly from the comments and announced next Wednesday! « Green Series: Dora the Explorer Goes Green? To get the ball rolling, I asked my six-year-old daughter. We recycle weekly and go to the dump every three months (we don’t have curbside service in the mountains:)) We also compost, so she doesn’t think of recycling or compost as trash. – What if things don’t decompose? I’d really like to win a copy. I asked my son what he thought, and he just said “no”. See, he’s only 18 months. “No” is his favorite word. Somehow, though, I think he managed to hit the nail on the head! Then we talked about landfills and hauling trash and she suggested that we try not to throw away as much. I told her that’s why we compost and donate and reuse as much as we can. And why I don’t buy her every single crummy toy she asks for. Wow- what an interesting book. If I win, I would read it first, and then place it in the classroom library. I think we’ve come a long way from the 70’s when I went to school concerning the environment, but I think everyone here would agree we can and should do more. My oldest is 3…so her answer was..the Trash men take it to feed the Trash Monsters…and then the Mommy monster makes babies. “recycling!” i guess I have to a better job of explaining. My one year old said ‘truck’ He loves watching the garbage truck. LOL. Hi, I dont have children yet, but I would still like to enter this giveaway! Thanks for a chance to win. “Ow. Uh guh.” Ok, she’s only 6 mos, but I asked, and we are serious beachy/marine animal people so our family would get a lot of use out this!